Adobe Flash coming to Android | Android Blast! 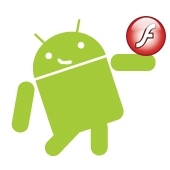 Adobe has confirmed that Flash is coming to Google's Android OS. The companies today revealed that that Adobe has made its Flash technology compatible with the Android. This is good news for T-Mobile's G1 as it may get a software enhancement that Apple's iPhone is yet to acquire. Andy Rubin, Google's director of mobile platforms, and Adobe CTO Kevin Lynch announced the development at the Adobe MAX conference. The two presented a demo of Flash 10 running on a T-Mobile G1.